Unlike British hallmarking (which is mandatory for all items of gold jewellery weighing more than 1g), gold jewellery made in India does not have to be hallmarked or assayed. For the consumer, there is therefore no guarantee that an item purchased contains the correct quantity of gold, or in-fact, any gold at all! If you have gold to sell, don’t forget to check out our up-to-date scrap gold prices. Occasionally, we’ll receive an item bought in Asia in good faith, seemingly stamped as being gold, but being fake. 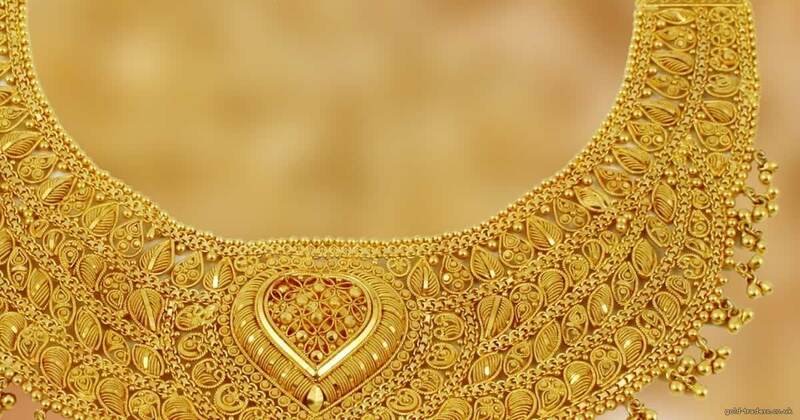 It is common to see Indian (and Asian) jewellery marked as ’22kt’, but when tested may only be between 87% to 88% pure, the equivalent of 21ct gold. This could be down to the quantity of solder used in intricate items (solder is often of a lower purity) or the jeweller simply using slightly less gold to increase their margin. To introduce more certainty within the Indian gold industry, the Bureau of Indian Standards introduced a voluntary BIS hallmarking scheme in 2000. For the consumer, an item of jewellery with the BIS mark can be relied on to contain the correct amount of gold. This is the official BIS logo. Jewellers who want to use the BIS mark must obtain a licence and adhere to strict guidlines relating to the purity of marked items. This mark identifies where the item of jewellery has been assayed and hallmarked. The date letter shows the year the item was hallmarked. Starting in 2000 with the letter ‘A’ and moving up one letter each year, it is easy to work out the correct date. 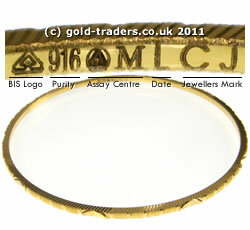 In our example photo above, the date letter ‘L’ tells us the bangle was assayed in 2011. This mark identifies the BIS certified jeweller / manufacturer of the item. I have a gold bangle that is stamped 22ct. Can anyone tell me if this means it’s actually 22 carat gold, please? If your bangle is just marked 22ct, it has more than likely been purchased abroad. You’ll need to get it tested to confirm it’s gold. Make sure you use someone who doesn’t charge for testing or for its return! Thank you for that, Phil. I have a pair of earrings marked 23C. I believe it to be purchased from India, and I am unsure what they truly are. Can anyone help me, please? 23 carat purity is not unusual in Asian gold, so the only answer I can give is that your earrings are probably gold. A mark of ’22ct’ give you no guarantee the item is gold. If you bought them in the UK, they should all have carry British hallmarks. If they don’t and they were sold to you as gold, report the seller to your local Trading Standards office. KDM is an abbreviation for Cadmium, a metal with a low melting point that is often found in Asian jewellery and is used as a solder. Cadmium is very toxic when melted & is known to cause cancer, hence it is banned in many countries. Your earrings are 21ct gold, so yes they are worth something! Use our calculator in the right-hand column to get a valuation. Done magnet test on gold bangle+it dosent stick ,inside bangle its got stamp +marks but hard to see what karot it is +done all home tests bite test +scrape test +passed do you think it is real gold ? Doing the magnet test on a gold bangle can be misleading because you’ll often find a steel tension wire running through its centre. It sounds like you need to identify those markings you’ve spotted… Get yourself a decent eyeglass / magnifier & see what the stamps say.